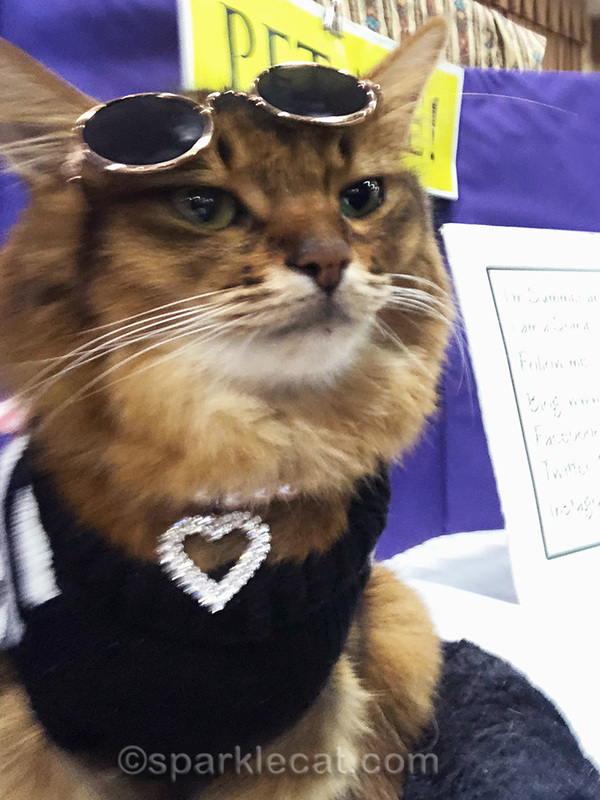 I had so much fun at the cat show! As you can see, I had my High Five paw at the ready. Binga has her whapping paw, but my paw is for High Fives! Anyhow, I’ll tell you all about the show in an upcoming post. 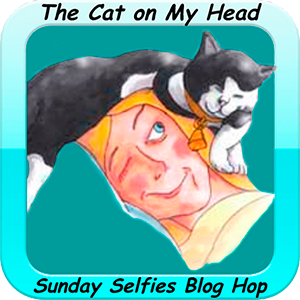 Today is for Sunday Selfies, so I took a quick break from all my cat show duties to grab a selfie. I decided to do it in one of my outfits. I actually didn’t wear a lot of outfits at the show. People enjoy touching my soft fur, so my human doesn’t like covering it up too much. (Although when I wear an outfit, it invariably draws a crowd!) But this was pretty cool. It was a sweater and necklace with a pair of sunglasses. Plus my new pink purse which you haven’t seen yet. So you can see why I wanted to do a selfie just then. First I had to adjust the camera — and I had to prop up the sunglasses to do that. I couldn’t see well enough with them on. And then… I put the sunglasses back on crooked! I never did get a selfie that I was satisfied with. So later on, I took a selfie with my other pair of sunglasses and it turned out much better. Love the outfit. And the shades are neat. Cool as a cucumber, Summer! 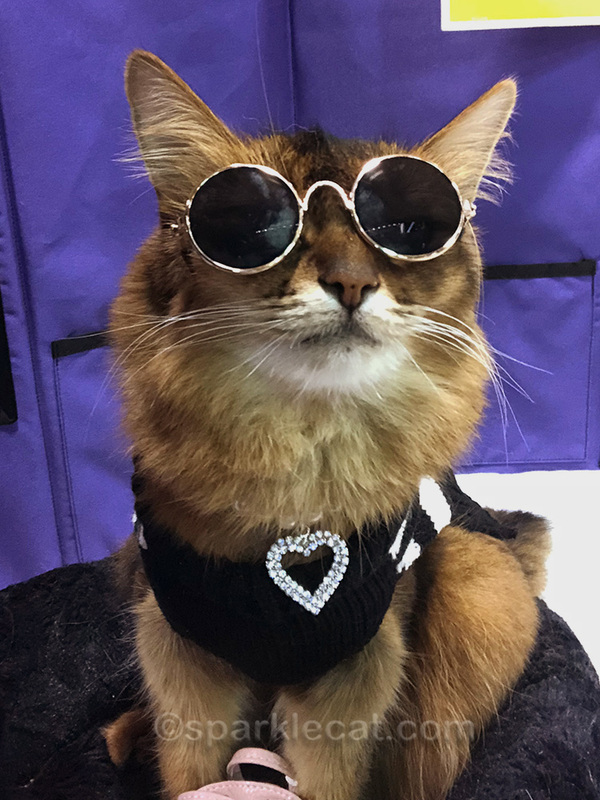 You are Joe Cool Cat with that outfit and glasses. Summer, you are rockin’ that picture with the glasses,sweater and purse(nice purse)!! You are so cool. Those shades were made for you. Summer you look so cool ! Especially with those sparkly glasses. 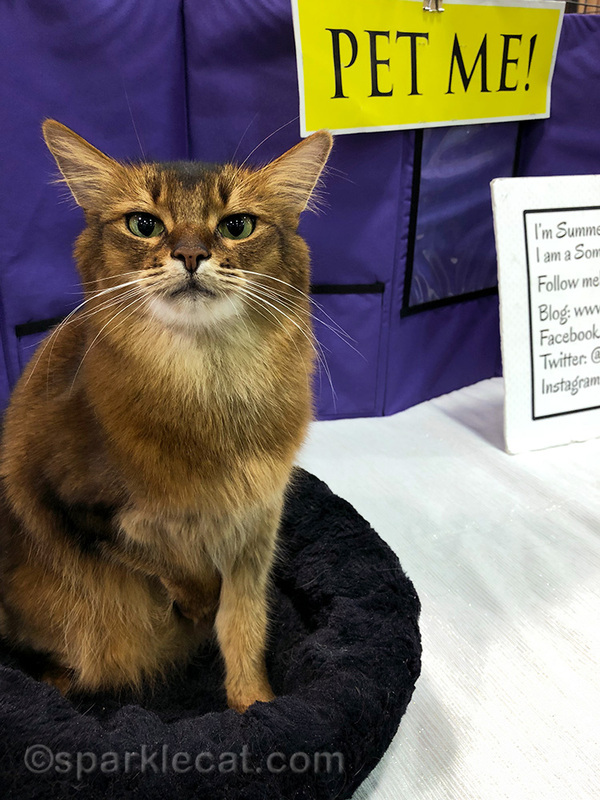 Thanks for taking time out from the cat show to share a lovely selfie. You look very cool with your glasses on. You look like such a superstar, Summer! You are so cute with those sunglasses. You are such a rock star, Summer! I love the second photo, it’s wonderful! will carry in your purse – maybe a few snacks/treats? cool. I think the correct word is “Fabulous”. Mee-yow Summer yore selfiess are pure *gold*!! An you look amazin inn yore dress an sunnyglassess an purse! Mee thinks angel Unkeel Siddhartha wuud have LOVeD this pho-toe fore shure! Summer I love the “John Lennon” glasses a lot but OMCs the heart shaped are so you! Summer, you’re the perfect sunglasses model. Summer, I see you have your High Five paw at the ready. I got a chuckled from Binga having her whapping paw at the ready. I really love those first two pictures and can see why you draw a crowd! Whee-oo! That second photo, in your hipster garb? Fantabulous!! You are a star Summer! What a darling selfie. You definitely have star appeal, Summer! That first pair of sunglasses is so classy and really suits you, Summer! OMC you actually WORE GLASSES! You are AMAZING! 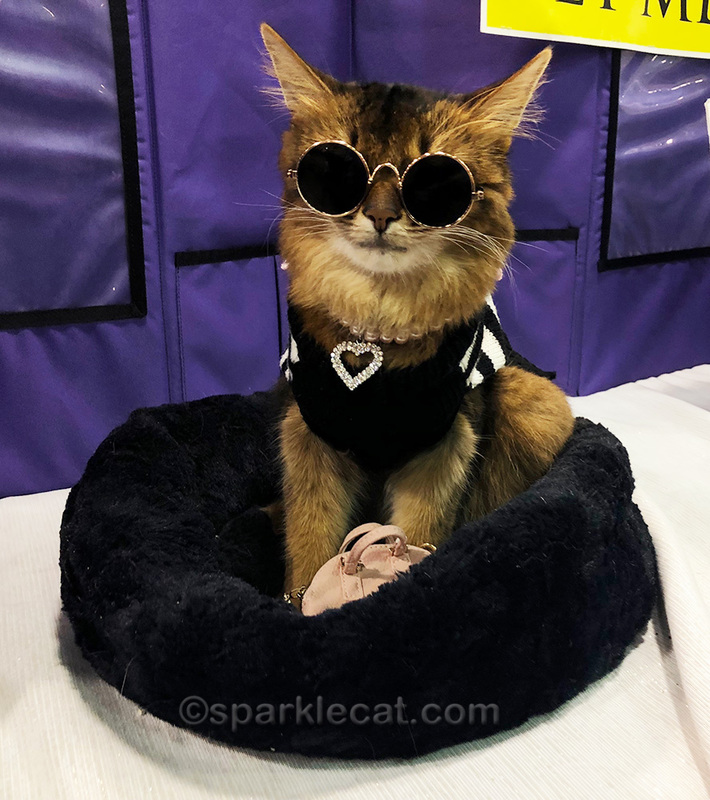 You are one cool cat, Summer! 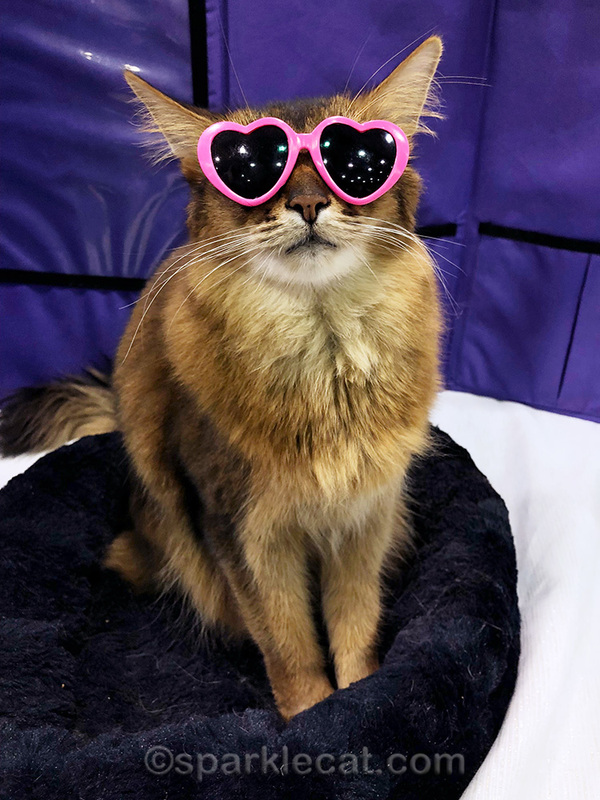 You really are a star in those shades sweet Summer! Summer, I LOVE the sweater and necklace and the dark sunglasses. I expect you could have been on a Beatles album cover…no kidding! You DO look hippie and I think you ought to tour with your human’s boyfriend. You’d fit right in. Great selfies, Summer. Have a fun Sunday. Such dreamy eyes, I wouldn’t want to cover them up… but then again those glasses are rather fetching too. Now if you had a nice headscarf you could be Judy Garland or another famous Hollywood star! OOoh we LOVE the sunnies. You look totally epic!